For 30 years, University Hospital EMS provided pre-hospital basic life support servies to the City of Camden, staffing the busiest units in the Camden County area. The Camden Division staffed it's own management, supervisors and specialty services, like the Newark counterpart. 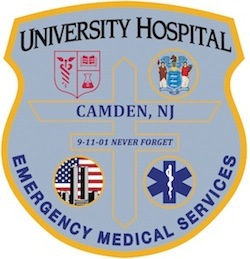 Effective January 2, 2016, University Hospital EMS has ceased it's Camden-based operations and offers the sincerest appreciation to all of the staff who provided the highest level of service during the tenure. All requests in respect to the Camden Division can be handled via the contact page.